A collection of stories from Kelly Link that reconstruct modern life and defy genre. 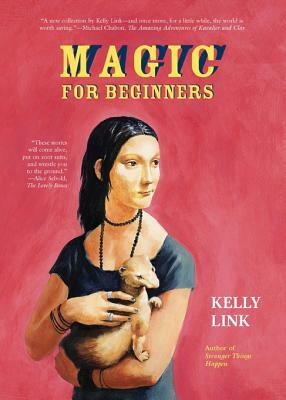 Magic for Beginners, is a potent blend of horror and magic realism and postmodern absurdism, but it's also not any of those things exactly … Link's fiction is both more accessible than it sounds in summary and more inventive than I can do justice to in this review. This is not to mention that she's funny. Or that there's air in her prose, dazzling turns of phrase on every page. The best of her stories combine the everyday with the bizarre to powerful effect … Even when I didn't know what to make of her stories, I couldn't put them out of my mind. That sort of resonance, that lingering, haunting effect, is the product of real magic, and Kelly Link is no doubt a sorceress to be reckoned with. This isn't exactly science fiction (it's not exactly not science fiction either). Link is the literary descendant of Jorge Luis Borges and Franz Kafka, those supremely matter-of-fact creators of alternative realities … This strangeness emanates not only from the subjects of the stories, but from the sentences. The first time I read Magic for Beginners I marvelled at the seamless integration of reality (a world that seemed familiar, characters I felt I knew) and otherness (a dream-world with rules I wasn't acquainted with but which I accepted as they came along). With each subsequent reading I became more enamoured of the language, the voice, the glorious sentences themselves … Link's stories intertwine to form a world more real than anything you could touch, taste or see; this world exists in the intimate spaces of your mind, real enough to visit, strange and familiar as a dream. Of the nine stories in Magic for Beginners, six, including the title story, have enough in the way of charm, wry humor, invention and canny social observation to demonstrate that their author is a talented and skillful writer … Link is a writer with distinctive style and imagination, but the elements of the bizarre in her tales often seem forced. It is as if they are there just to grab our attention by shocking, surprising or teasing us, not because they are organic to the story. What did you think of Magic for Beginners?